Please complete this form to contact us or to request a price quote for white dove release services. For your convenience, after you submit this form, you will be automatically directed to the next page which will allow you to print our Order Form. Thanks! NOW BOOKING ALL EVENTS FOR THE 2016 SEASON. Over the years we have become dedicated sponsors for these two organizations on a National level covering multiple states. We will release our birds for free for these special causes. Contact A United Doves Representative for details in your area. (Some Restrictions Apply). Summary: We're white dove release pioneers! We offer dedicated service, professionalism, and passion. With help from the World Wide Web, and our extensive experience in the IT field, along with database marketing experience and strong faith in what we do, we have created a market for dove services across America like never before! 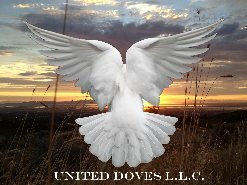 United Doves is a service-connected veteran-owned business! We will perform dove releases within a 150 mile radius of Salt Lake City, UT. If your event is outside of this radius, additional fees will apply. Please call for details. We can decorate the cages with a color of your choice if you provide the décor. The doves used in the display cages are your choice of white Fantail Doves or white Turtle Doves. Note: The birds in the display cage will not be released, unless you make a prior arrangement to use white rock doves in the display.